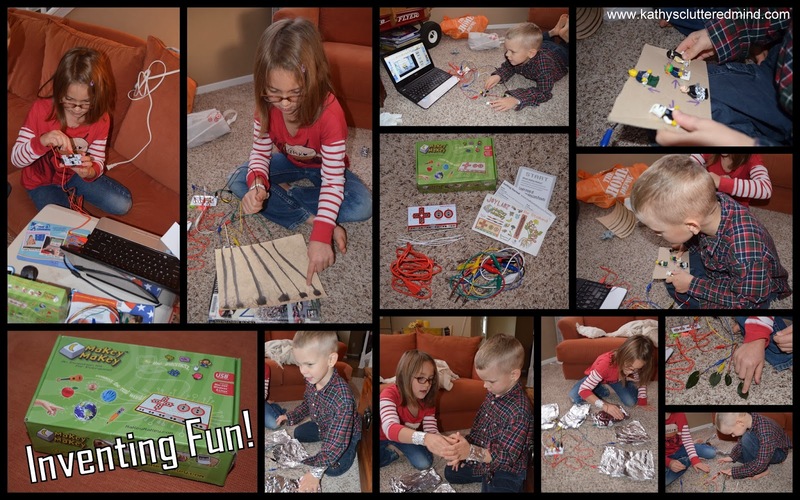 MaKey MaKey is an invention kit for the 21st century created by Jay Silver and Eric Rosenbaum. These two creative masterminds have been working with invention kits for the last decade. The MaKey MaKey kits is based on research at MIT Media Lab and the circuit was designed in collaboration with Sparkfun. The original funding for the project was Kickstarted! MaKey MaKey turns everyday objects into touchpads and combines them with the internet! "Warning! User may start to believe they can change the way the world works. Extended usage may result in creative independence," from the MaKey MaKey box. We are a family of geeks and always interested in learning about the latest technology and the next amazing gadget. (Yes we spend too many hours watching CNET and TED TV). We especially enjoy educational technology and gadgets that can help our children learn and grow. So in December my two TED TV addicted children watched a video about MaKey MaKey and fell in love. They said, "mom we need one of those for homeschool, we could learn so much." 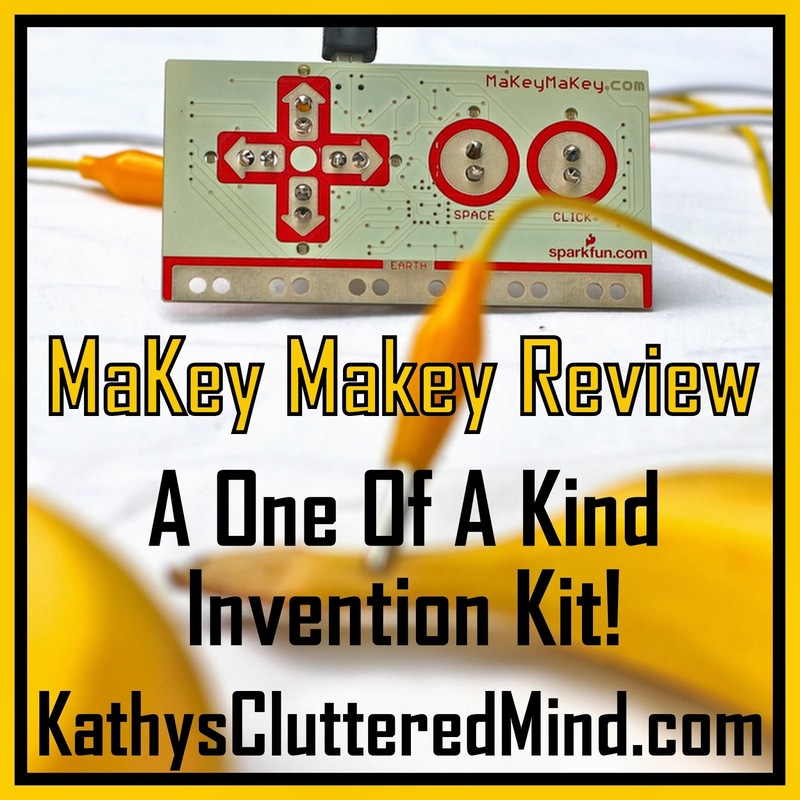 So I contacted MaKey MaKey and they were generous enough to allow us to review this amazing, one of a kind invention kit. This kit is NOT just for children though it is tons of fun for adults too! It is for beginners and experts! Makey Makey is really one of a kind. I have never come across anything like it before. It is simple to use and encourages children and adults to be creative and think outside the box. We literally spent hours playing with it the first day. The children had tons of fun trying to find items to turn into controllers. They used play-doh, tin foil, food, pencil on paper, leaves, each other, pennies and more! Even I learned a thing or two about conductors! MaKey MaKay inspires children to explore, invent and problem solve. And MaKey MaKey incorporates important skills in math, science, technology, art, music and more. Makey Makey is so simple to use that even a 6 and 8 year old can do it. You simply plug the MaKey MaKey into your computer with the USB Cable. Connect yourself to earth with an alligator clip (we made tinfoil bracelets so the kids didn't have to always hold onto the clip). Next connect the remaining alligator clips to anything and everything that is conductive and have fun! It was so much fun to experiment and play! MaKey MaKey easily works with any program that utilizes a keyboard or mouse. In the video below my son made a Lego MiniFig remote with some cardboard, MiniFigs and tinfoil. Then he played some of his favorite games on Lego.com. MaKey MaKey provides a great list of software on their website to get you started. Gwyn's (age 8) review: I love the invention kit. It was lots of fun to make music and play games with food, nature, art and other stuff. I love exploring and learning about science. Every kid should have a Makey Makey kit. You can purchase MaKey MaKey directly off of their website for $49.95. You can also pick up your MaKey MaKey kit on Amazon.